As a non-Philadelphia resident, I wish I had the luxury of accessing a true Philly cheesesteak at a moment's notice. Who could resist the gooey, melted cheese on top of a pile of flavorful ribeye steak adorned with caramelized onions and peppers? I was craving this delectable sandwich the other day and although I didn't have the major ingredients to attempt making a Philly cheesesteak, I made these Philly Burgers instead. Not exactly the same as the real thing, but it does pay homage to Philly's famous sandwich! If it can top a Philly cheesesteak, why couldn't it top a burger too? This burger is simply seasoned and the burst of flavor definitely comes from the toppings. 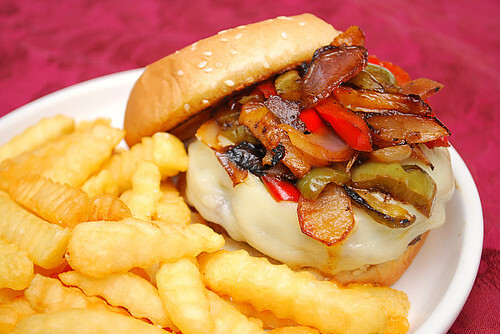 On these Philly Burgers, a slice of provolone cheese and a mixture of caramelized sweet red onion and a melange of sauteed bell peppers gives this burger props to the Philly cheesesteak. Feel free to switch it up to suit your tastes as some folks like their cheesesteaks with sauteed mushrooms or even a different cheese such as white American cheese, Mozarella or Cheez-Wiz. In a saute pan over medium high heat, add 1 tablespoon of canola oil. When the oil starts to shimmer and is hot, add the sliced onion and bell peppers. Saute until soft and continue cooking until caramelized, about 7-10 minutes; remove from heat and set aside. Cook the burgers in a hot pan with the remaining oil or on the grill, brushing each patty with oil to prevent sticking. Top each burger with provolone cheese and a basting cover during the last minute of cooking. Place the burgers on the bun bottoms. Top each with a mixture of caramelized onions and peppers. Cover each burger with the bun tops and serve immediately. me and the wife were just talking about Phily burgers last night because we saw this massive burger in travel and living. that has everything in it including beef teriyaki. will sure make this one pretty soon.